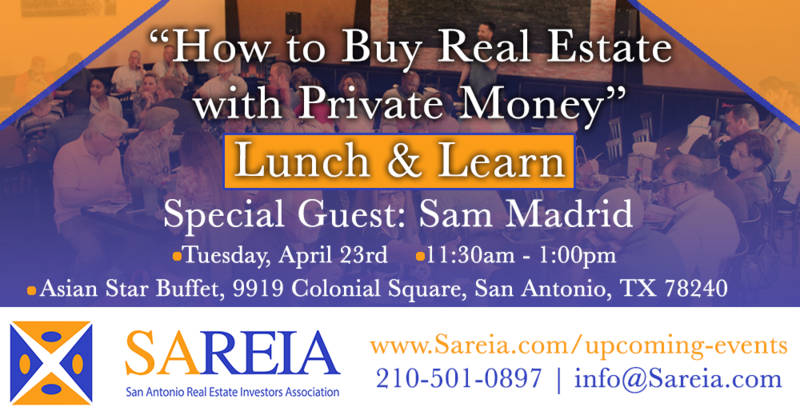 San Antonio Real Estate Investors Association - Lunch & Learn- "How to Buy Real Estate with Private Money"
Lunch & Learn- "How to Buy Real Estate with Private Money"
We are excited to invite Sam Madrid, a local real estate investor expert, who has done over 1,000 real estate transactions with Creative Owner Financing. Sam is the master at finding distressed homes in the low income areas, selling them "as is" with owner financing. Sam also uses private money to acquire the real estate deals, at an 8% interest rate for private investors, with a five-year balloon, and interest only payments. He then sells the property for twice what he normally buys it for "as is", at 10% interest and waits about six months before he then sells the note for full market value.